For the past two(ish) months I've been in video game competition of sorts with a good friend of mine. A couple weeks ago he came up with the idea of writing short impressions of the games we've been playing (and since these games come from our combined collection of games, it would be nice to get our thoughts down on these games after playing them...convenient). The articles will be posted on both my site and his site. John: I’ve actually played a lot of backgammon, but it’s been so long since I have, I’d forgotten the rules. I also didn’t have a manual or the controller overlays for the game so this turned out to be a rather tough game. It didn’t look great, nor did it sound good, but it was functional. 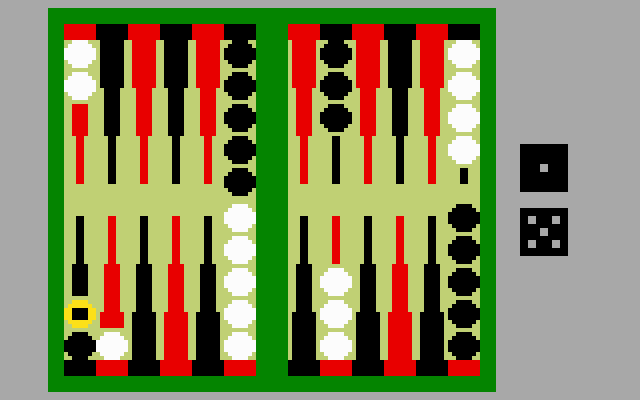 I can’t imagine opting to play this against another person if I had an actual backgammon set, but I suppose playing against the computer is a valuable feature. Not a recommendable game though. Looks exciting doesn't it? Well it's not. 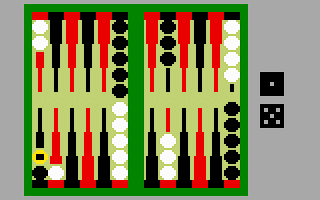 Jeff: I know nothing about backgammon and playing this game didn’t enlighten me on the game’s rule set. I would not recommend this game.